Recognised for their positive buoyancy and stability, a pontoon boat had always been at the top of the list for Craig. After testing the hardtop Profile 585H, he said it was just like coming home, and he was pretty much sold on the spot. There is something about the hull shape of pontoon boats that makes them very easy to launch, especially with one person. 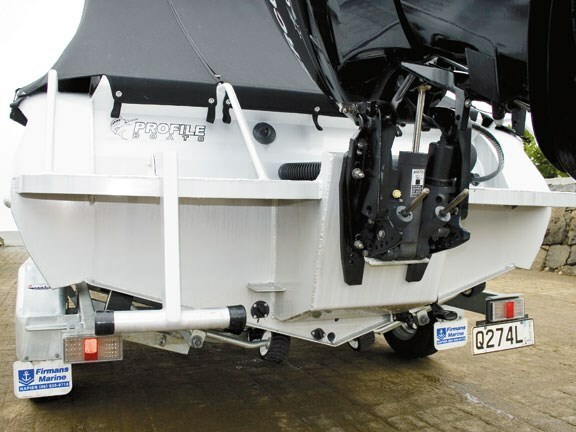 The Profile 585H is no exception; just tie a long rope to the bow cleat, remove the winch hook, undo the safety chain and it rolls off the trailer. 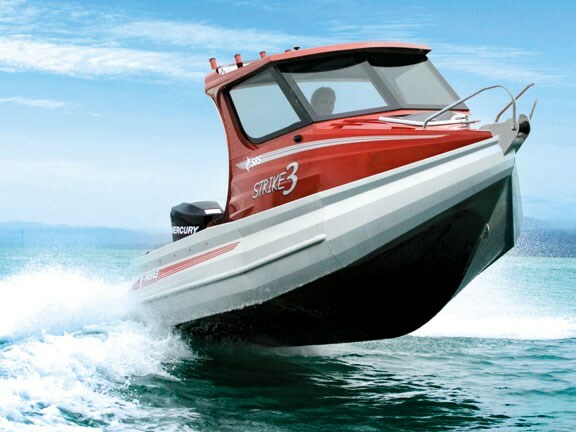 This is a boat built for function. Most of the tools to get the job done are here with very few extras. 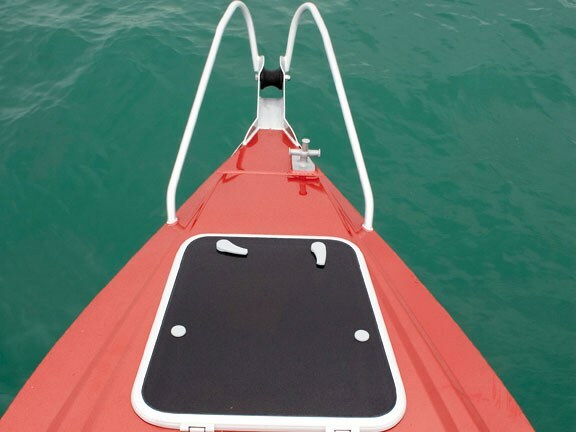 The bow sports a fairlead of robust construction including a pair of quite high rails that help to ensure the anchor line runs in the right place and provide a sturdy handhold. 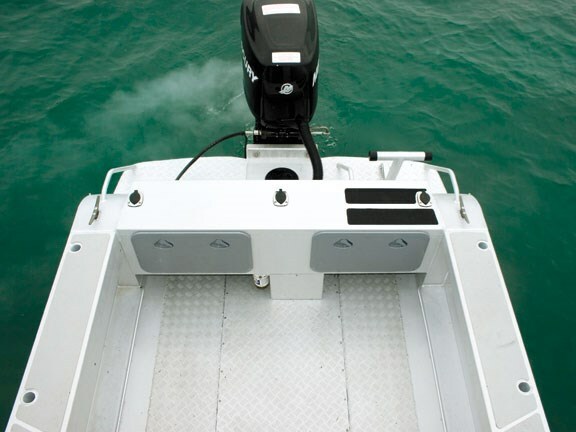 A large, quality hatch provides access to the bow section. No external anchor locker is present – that task is taken care of internally by a purpose-built hold inside the forward cabin. There is room on the bow for a winch. The forward cabin space has been left completely open. The floor has been sensibly sectioned off by welded alumiuim rails. These "compartments" are ideal for bin storage and provide handy tethering points. Three-quarter bunks can be optioned in. The floor is standard industrial deck-plate, which is fine, but some floor tubing would improve the overall comfort. A fairly large fish hold\wet locker is situated amidships. A good option as it is self-draining. The twin pedestal seats are comfortable enough and positioned to allow plenty of space to stand at the wheel. These seats are mounted on fixed boxes that provide useful storage. I really liked the completely open, clutter-free fishing space. The gunnels are at a comfortable height and make safe and comfortable seating while hauling in giant snapper. 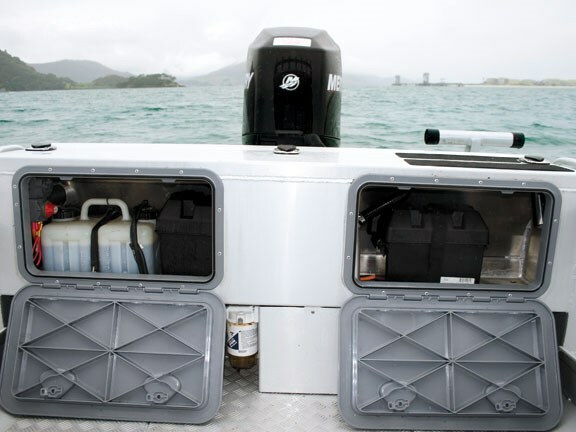 Both transom storage lockers are fully utilised with the twin battery installation and a substantial oil reservoir. The fuel filter has been mounted outside in clear view so the skipper can quickly spot any water in the trap as soon as it appears. Craig has not opted for a built-in livewell as he can always retrofit a plastic one. He has, however, gone the whole hog when it comes to rod holders. Strike Three has nine built into the gunnels, including three in the transom. The rocket launcher comes as standard on the Profile 585H. This is a boat with plenty of storage for its size. 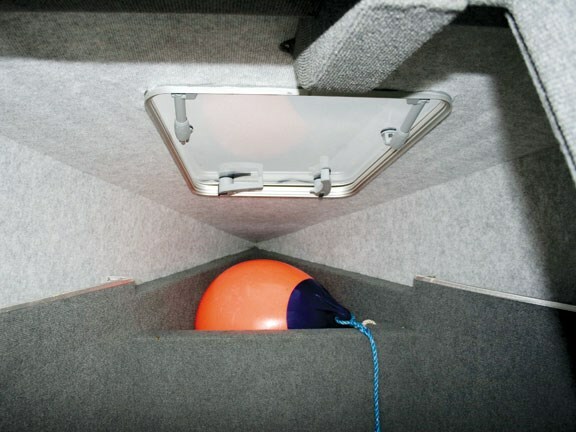 In addition to the under-seat compartments and completely open cabin area, there are full length parcel shelfs in the cabin and full length extra wide shelves in the cockpit, ideal for dive bottles. 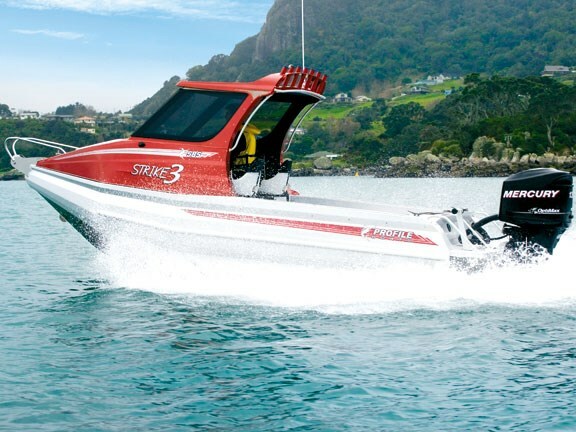 Other impressive features of the Profile 585H are the large number of grab rails, the boarding ladder, midship cleats for use with outriggers, and the large tinted safety-glass windows. 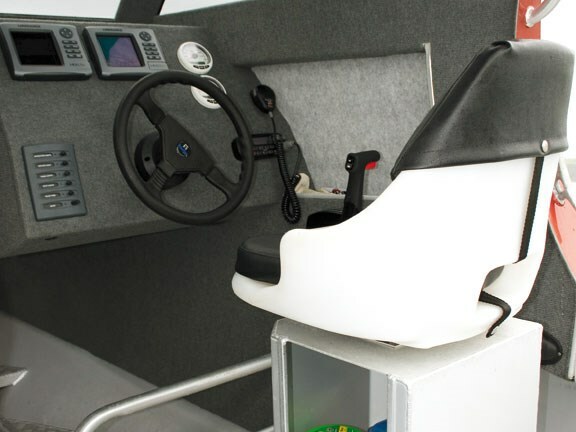 Firmans Marine offers a reasonably comprehensive list of optional extras including trim tabs, a capstan, a keel wear strip, a toilet, and a sliding side window. Craig kept the outfitting of Strike Three fairly minimalistic, which has helped keep the weight down. Obviously the 585H was going to be fast enough in a straight line (top speed over 40 knots) but how would it handle when worked a bit harder? 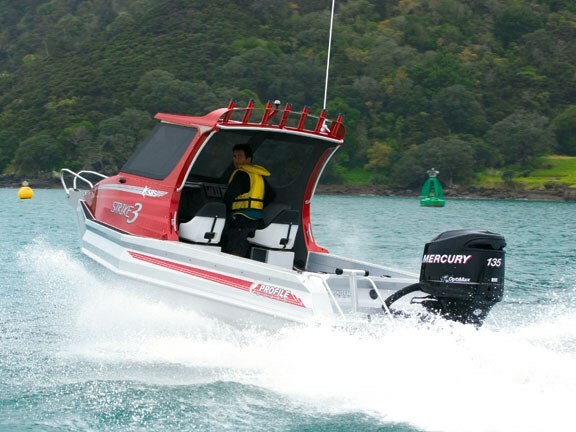 Burying the throttle on the Mercury Optimax 135 fuel-injected outboard produced instant acceleration. The boat simply leapt out of the hole. We reached 30 knots ridiculously quickly. The steering is fairly light and it was with caution that I chucked her into the first turn. Soon enough, however, it was clear we were not in for any unexpected surprises so it was with ever increasing confidence that I threw the boat about. This is a very responsive and predicatable boat and it was a lot of fun to toss around. The steering could do with a little more positive feel for my liking, just to ensure the driver is fully aware of the helm position, but overall it’s a good drive. With little in the way of a seaway to test the hull in, we resorted to some wake jumping. I was impressed with the true lines the boat tracked over the wakes and the landings were square and reasonably soft. The Mercury Optimax performed flawlessly as well. Craig has found it to be fairly economical and so far free of any of those problems two-strokes are sometimes prone to such as oily plugs and excessive smoke. The 100L fuel tank is adequate with this motor but probably does not provide enough range to make it anything other than a day boat. The noise in the cabin is pretty high in comparison to others I have tested. This is common problem with hardtop boats. 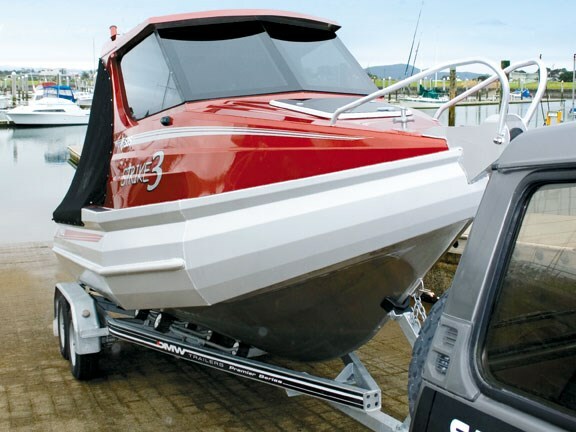 The Profile 585H is a good example of a pontoon boat. 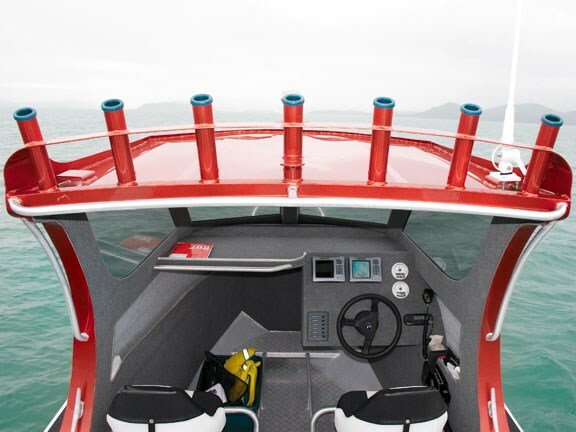 Sound construction and good finishing are very evident on the test boat and its performance is impressive. 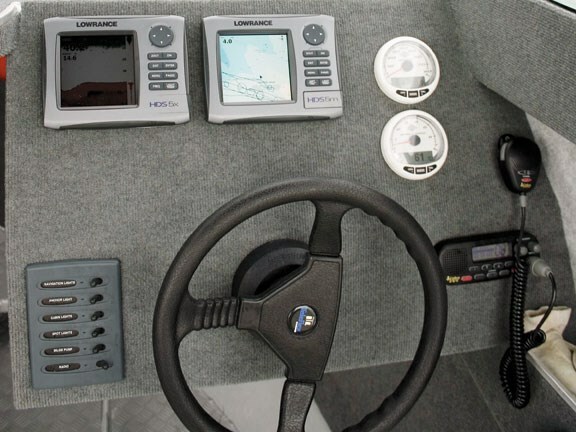 The level of optioning available means a range of budgets can be catered to around a quality hull. The on-the-water performance is impressive, reflecting its adherence to sound design principles and solid construction. Transom height 508mm (20") 25" Option.